Instructions: To create this card, take your black cardstock and diecut the eyelet lace frame. Once done mat against a sheet of paper from the collection. Now take your cut mat die and cut one of the patterned paper in the shade of blue and cut. Lay this against your card center. 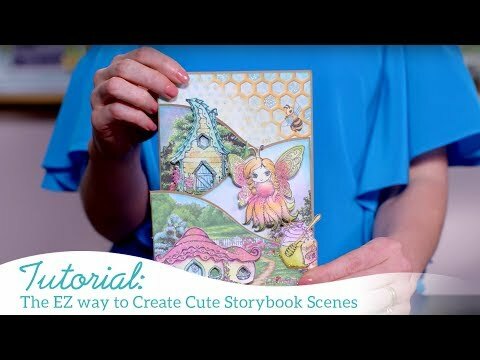 Take your dies and diecut the bee and bee house from the sheet of paper and adhere to your card. To make your flowers take your VersaMark ink and stamp a total of 6 large and 6 small peonies onto your vellum paper. Now add your black embossing powder and heat set. Once done take the matching die and cut all your flowers from the vellum paper. Using a glue gun, glue a large and small peony onto one another. Color your flowers using the Pitt brush pens in orange and yellows. Using a hole punch - punch centers for your stamens and add black with yellow-orange pearls into a bunch.